In spite of the fact that many banks will not lend to small businesses, some large banks are coming forward to make capital more accessible to women-, minority-, and veteran-owned small businesses. Why? Because it is "not only good for the economic health of the community, but it’s also good business,” according to CEO, Business Banking at JP Morgan Chase & Co., Jenn Piepszak. Chase's global Small Business Forward program has doubled in size, prepared to give away $75 million over the next three years to support women-, minority- and veteran-owned small businesses. The Small Business Forward program began in 2014 and has continually supported small businesses with capital to help them grow. According to the U.S. Small Business Administration (SBA), there are 28 million small businesses in America that account for 54 percent of all U.S. sales. In addition, small businesses account for 55 percent of all jobs and 66 percent of all net new jobs since the 1970s. Yet only 16 percent of conventional small-business loans go to women-owned businesses, and less than two percent of SBA loans in 2013 went to African-American owned businesses. The increased capital will provide more lending funds for women-, minority-, and veteran-owned businesses who are often unable to qualify for traditional loans. 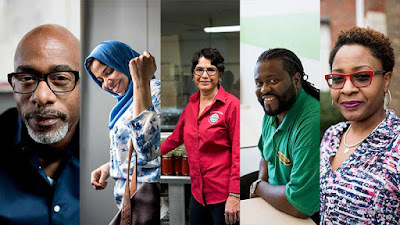 The $75 million from JP Morgan Chase includes a $1.9 million grant to the Association for Enterprise Opportunity (AEO), and $4.6 million to non-profit lender LiftFund for its LiftUp Initiative program. The funds will go a long way toward leveling the playing field for entrepreneurs of color, immigrants, women, and veterans, especially in growth fields such as technology, health, and bioscience.